After breakfast leave for Gaurikund (32 KMS drive-one way). On arrival start your journey on the by foot tough trek ahead. Stop for lunch en route and continue to trek Shri Kedarnath Ji. On arrival check inn at hotel. After freshen up, perform Pooja and also Darshan at Shri Kedarnathji. In the evening also visit Adi Shankaracharya Samadhi behind the temple. Overnight at Hotel. Morning Darshan and after breakfast return to Gaurikund by trek. On arival picked by our taxi and transfer to Guptkashi (32 KMS /1 hrs). On arrival rest at hotel in Guptkashi. Overnight at Hotel. After breakfast check out from the hotel, Proceed for Joshimath via Rudraprayag & Karnaprayag surface approx 180 kms. On arrival check in at hotel. Overnight stay at Hotel. After breakfast Proceed for Srinagar by surface approx. 190 kms. On arriva lcheck inn at hotel. Overnight at hotel. After breakfast Proceed for Rishikesh by surface approx. 90 kms. On the way stop for lunch at Devprayag and visit Devprayag ( The confluence of rivers Alaknanda and Bhagirathi, which become the Ganga). Reach Rishikesh. Check in Hotel. Evening visit Laxamn Jhula and Ram Jhula and see the evening arati. Overnight stay at hotel. Optional- En route halt at Devprayag and Rudraprayag for little time. After breakfast pick up your packed lunch, and leave for Gaurikund (32 KMS drive-one way). On arrival start your journey on the tough trek ahead. Stop for lunch en route and continue after that to arrive by late afternoon. After freshening up, perform Pooja and also Darshan at Shri Kedarnathji. In the evening also visit Adi Shankaracharya Samadhi behind the temple. Return to Guptkashi. 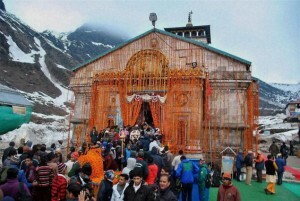 Overnight at Hotel.Optional- If guest decide to Trek to Kedarnath , stay can be booked at Kedarnath also. After breakfast leave for Rishikesh by surface approx. 300 kms. On the way stop for lunch at Srinagar. Continue the journey and if time permits, visit Devprayag ( The confluence of rivers Alaknanda and Bhagirathi, which become the Ganga). Reach Rishikesh. Check in Hotel. Evening visit Laxamn Jhula and Ram Jhula and see the evening arati. Overnight stay at hotel.